The Outlander writers answered questions about episode 310 on Tuesday. Luke Schelhaas wrote the episode, but it was not declared who was answering the questions this week. Below are the answers provided to fans this time around. 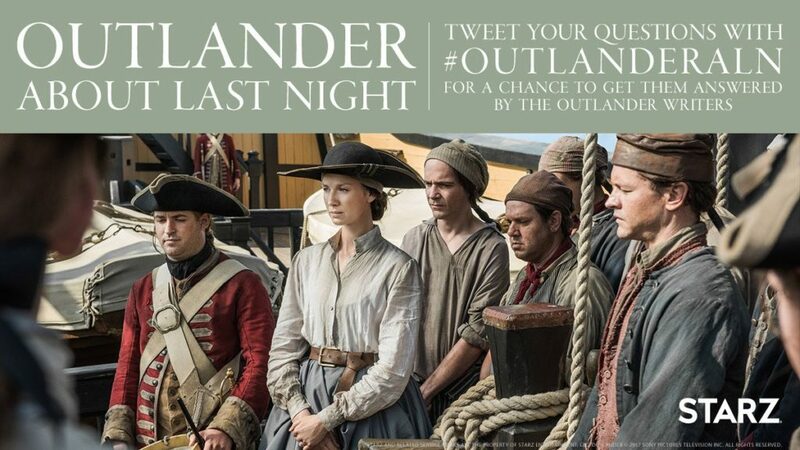 @OutlanderWriter #OutlanderALN Are the scripts written in sequence? If not, why? @OutlanderWriter #OutlanderALN Would Claire have been tempted to use her penicillin, especially with Elias? So you have "spirited" discussions in the writers room? Does that include the actors as well? Who is the referee? #OutlanderALN Listened to podcast and spoke of servicing all the main char in episodes. Will you be able to maintain this in S4 with storylines outside J&C? @OutlanderWriter #OutlanderALN Noticed everyone on the ship Claire is on, is calling her "Mistress Fraser" HOW do they all know her real name? she was going by Mistress Malcolm? Only the half blind dude knew who she really was and the captain after he told him. #OutlanderALN whew! Episode 10! Only 3 more! Was it very difficult making the script for 3 eps knowing that theres still so much more to show?how did u compress it all? This entry was posted in Luke Schelhaas and tagged Heaven & Earth, Luke Schelhaas, Season Three, Twitter Q & A by Sarah Ksiazek. Bookmark the permalink.